Melbourne Victory looked to have defeated Newcastle Jets comfortably after taking a two-nil lead on the stroke of half-time, but had to withstand a fight-back by the visitors, which saw them draw level deep into the second half. But Victory’s Kiwi international winger Marco Rojas conjured up a brilliant goal to give the Melbourne team a narrow but deserved win in the end. It was a superb, open game with both sides going at each other as if the league title was at stake in this match alone. Both sides had to make several changes to cover injuries and in Victory’s case suspensions. Victory had skipper Adrian Leijer and Socceroo Mark Milligan suspended, while Diogo Ferriera was injured last week in the Heart derby. Nick Ansell held his place in defence, but Peter Franjic’s fallibility against tough strikers resulted in the other central defender’s spot going to the more experienced Leigh Broxham. Jason Geria was due to start on the bench along with Andrew Nabbout, Spase Dilevski and Tando Velaphi, but Geria was replaced by Isaka Cernak a few minutes before kick-off. Newcastle missed Michael Bridges, Scott Neville and Jobe Wheelhouse among others, which meant that Gary van Egmond fielded a very young side with the talented James Virgili and Craig Goodwin prominent on the flanks. Helen Kapalos prepares to toss the coin. 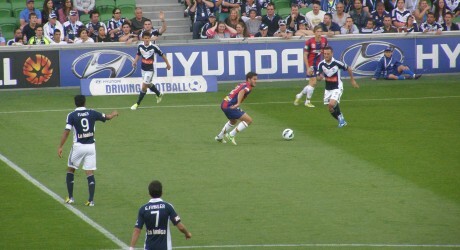 Victory played some excellent one-touch football in the opening phase of the game, and the fans played their part by encouraging midfield playmaker Billy Celeski to shoot when Jets keeper Mark Birighitti was caught well off his line. Celeski unfortunately muffed his shot which sailed harmlessly over the bar. When Victory tried and failed to play out from the back in the fourteenth minute, the Jets won the ball and corner kick, but Connor Chapman, another of the youngsters, headed over the bar. The Jets were winning most of the high balls into the Victory penalty area but the headers which resulted were either ill-directed or under such pressure that the defenders or keeper Nathan Coe mopped them up. Despite giving away height and weight to English internationalist Emil Heskey, Leigh Broxham won his fair share of the ball in the air and on the ground. Nick Ansell added to his growing reputation with a composed performance alongside him in central defence. 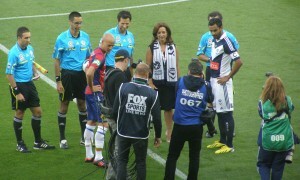 Victory took a quick free kick after Archie Thompson had been fouled about 30 metres out. The ball was picked up by Marco Rojas ,who rounded his man and sent a delicious curling shot past Mark Birighitti. That goal came in the 33rd minute. It was followed in the last minute of normal time in the first half when Victory rebounded from its own half and Rojas sprinted clear down the right to deliver a grounder for the onrushing Thompson to beat the keeper. A moment before Thompson had just put a shot outside the post from an excellent cross by full back Matthew Foschini. Jets raised the tempo in the second half and Broxham almost conceded an own goal in trying to defend a cross from the right, but in 51 minutes he denied Emil Heskey a headed goal with a spectacular clearance from right under the cross-bar. Victory broke quickly through Thompson who found Gui Finkler, but Finkler got into a fankle and the moment was lost. The Newcastle players deserved some reward for their seizing the initiative and got it when Broxham lost possession in his own half and Ruben Zadkovich fired a grounder past Nathan Coe. To be fair Broxham then got back to deny the Jets when another Victory move broke down. Now the momentum shifted and ten minutes later the Jets were level after a free kick was flicked on to Heskey who fired it past the stranded keeper. Victory fans rallied the players with their noisy support and in a combined move involving Gui Finkler, Marcos Flores and Archie Thompson the ball was delivered to Rojas on the edge of the penalty area. He dropped his shoulder and created just enough space to release another shot which flew past Birighitti. Andrew Nabbout came on in place of Flores in 77 minutes and almost scored with a shot from a quick throw-in by Foschini. Nabbout’s dipping effort skimmed the cross bar. Both sides made substitutions with Isaka Cernak replacing Gui Finkler for the home team. Victory played out the last few minutes as the Jets battled unsuccessfully to find another equalising goal. Ange Postecoglou thought that the first half was largely how he wanted Victory to play, but he felt that in the second the team failed to stick to the structure he wanted, though their will power showed in their virtually instant response to the Jets getting on terms. Gary van Egmond felt that his team played one of its best games of the season and had control for much of the time, but just failed to recognise incipient danger when the Jets had the ball. He said that was a feature of young players as it takes them time to gain game awareness and to anticipate problems before they become dangerous. Overall Victory deserved its narrow win in a great advertisement for the A-League watched by 21,054 fans. 39. Nathan COE, 2. Matthew FOSCHINI, 3. Adama TRAORE, 6. Leigh BROXHAM, 7. Gui FINKLER (19. Isaka CERNAK 84’), 8. Jonathan BRU (21. Spase DILEVSKI 64’), 9. Marcos FLORES (26. Andrew NABBOUT 77’), 10. Archie THOMPSON, 11. Marco ROJAS, 14. Billy CELESKI, 24.Nick ANSELL. Unused substitutes: 1. Tando VELAPHI. Yellow cards: Jonathan Bru 40’, Matthew Foschini 83’. 20. Mark Birighitti, 4. Josh Mitchell, (7. James Brown 87’) 5. Dominik Ritter, 8. Ruben Zadkovich, 9. Emile Heskey, 11. Connor Chapman, 12. Josh Brillante (18. Jacob Pepper 85’), 13. Sam Gallaway, 15. Craig Goodwin (22. Adam Taggart 85’), 17. James Virgili, 23. Ryan Griffiths. Yellow cards: 13 Sam Gallaway 27’, Josh Mitchell 32’.